The selective proteasome inhibitor MG-132 (Calpain Inhibitor IV) is a tripeptide aldehyde with the sequence Z-Leu-Leu-Leu-H (aldehyde) and is depending to its hydrophob sequence poorly soluble in water or in aqueous buffers. MG-132 is soluble in several organic solvents like DMSO (25 mg/ml), Ethanol (25 mg/ml), Methanol or DMF. To prepare aqueous stock solutions, MG-132 should be dissolved first in organic solvents and then carefully diluted into aqueous buffers. Aqueous stock solutions of Z-Leu-Leu-Leu-H [MG132] should not be stored for longer, because of the terminal aldehyde, which is subject to oxidation. MG-132 (Z-Leu-Leu-Leu-aldehyde) will be shipped at room temperature and should be stored after receipt in a freezer. It is reported that the combination of MG-132 with the proteasomal inhibitor Lactacystin may induce synergistic apoptosis in prostate cancer cells. Our Calpain Inhibitor IV is available for soon delivery ex stock Germany. We can offer both small and larger quantities under very favorable conditions. Please ask for your special offer for 25 or 50 vials per delivery. 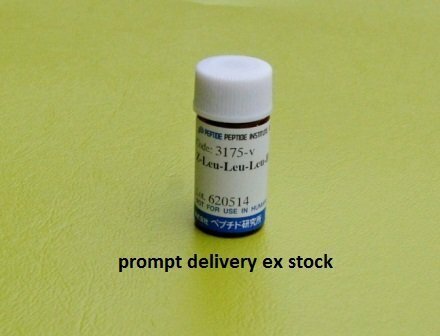 Z-Leu-Leu-Leu-H [MG-132] is distributed through Peptide Institute, Inc. under the license of Dr. H. Ito.